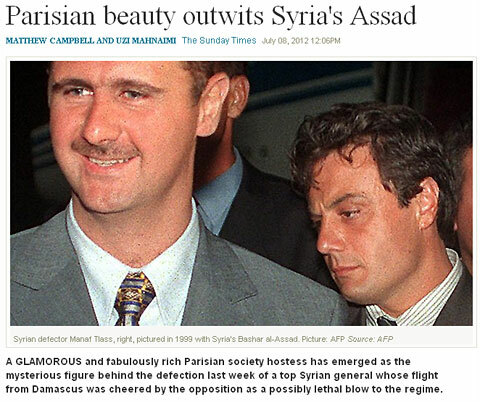 7/8/2012 – "Parisian beauty outwits Assad", read the headlines. 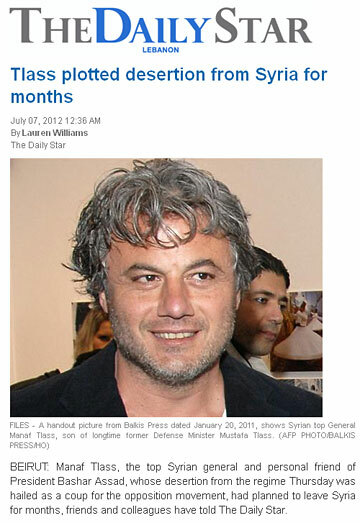 Manaf Tlass, the top Syrian general and personal friend of President Bashar Assad, had defected to Paris, dealing what many correspondents call a death blow to the murderous regime in Damascus. The desertion was planned by a "glamorous and fabulously rich Parisian society hostess." So why are we telling you all this? First the story, as narrated in the international press: apparently the "glamorous and fabulously rich Parisian society hostess" who has emerged as the mysterious figure behind the defection, was Nahed Ojjeh, an arms dealer's widow, helped to ensure safe passage to Paris for Manaf Tlass, her brother, who was a general in the Syrian army and personal friend of Bashar al-Assad, the dictator. The Sunday Times tells us that the 52-year-old lady, known to some of her acquaintances as “Madame O”, has lived in France for 33 years and has performed the same service earlier this year for Mustafa, her father, a former defence minister, and Firas, her other brother, a businessman, when they fled to Paris. Manaf Tlass, 48, who spent the past few months under house arrest, will join his wife and children in his sister's Parisian mansion in the chic 16th arrondissement. Ojjeh, we are told, has been described by friends as one of the most elegant and beautiful women in Paris. She married Akram Ojjeh, an arms dealer, in 1978, when she was just 18 and had reportedly been dating his son. He was 60 and had sold military hardware to Saudi Arabia. When he died in 1991, his widow inherited most of a fortune estimated at $1 billion. Einstein: the players have all been paid! 15.01.2003 – She came with high hopes of reunifying the chess world. Nahed Ojjeh, Syrian-born multi-millionaire, created the NAO chess club and joined forces with the British Einstein Group and even put up the prize fund of the 2002 Einstein "Candidates Tournament" in Dortmund. Apparently some of the monies did not go to the players, and Einstein stopped answering enquiries. Now Madame Ojjeh has broken all relations with the Einstein Group. More. 21.07.2002 – At a press conference in Dortmund our chess correspondent John Henderson spotted classical chess world champion together with a very charming lady. It was Madame Nahed Ojjeh, one of the great new benefactors of chess. Read all about it in his latest column and about other matters surrounding the Candidates Tournament. 03.07.2002 – Who is the lady in the picture on the left? Syrian by birth, now living in Paris, and one of the financial driving forces of present-day chess. She is sponsoring a Paris chess club, has staged a classical super-tournament and is now backing the Einstein Group (to the tune of € 300,000) in the Dortmund Candidates. Read all about the incredible Madame Ojjeh here. 25.04.2002 – The Einstein Group in London and Nahed Ojjeh have announced their support of the reunification of the chess world. To this end they are seeking collaboration with all interested parties in a daring new proposal that is to be discussed at the upcoming Eurotel Trophy in Prag. The funding would be mainly supplied by Madame Ojjeh, a Syrian born billionaire who lives in Paris. You will find the joint press release of both parties here. Her name appears more and more often in the chess world. Born in Syria, she now lives in Paris, where she dedicates herself to the promotion of chess and is regarded as the greatest international sponsor of the royal game. We are talking about Madame Nahed Ojjeh, who is is currently backing the Einstein Group, which in turn is responsible for the candidates tournament in Dortmund. 30.04.2012 – Is anybody surprised? Yesterday FIDE President Kirsan Ilyumzhinov was in the Syrian capital and had a three-hour talk with beleaguered President Bachar Assad, who, according to Ilyumzhinov, "plays chess very well – since his studies in London". During their discussions Assad "pledged on a number of occasions his allegiance to the peace plan proposed by Mr. Kofi Annan". Press release. 16.06.2011 – News and TV channels picked it up with glee: while NATO aircraft were (probably) targeting Muammar Gaddafi directly, the Libyan dictator sat down with the "eccentric" President of the World Chess Federation for a friendly game. Not really a positive picture, and harsh criticism has rained on Kirsan Ilyumzhinov. He sees his visit as a mission of peace and has appealed to people not to politicize the issue. 13.06.2011 – In a somewhat precarious move FIDE President Kirsan Ilyumzhinov has visited the Libyan leader Muammar Gaddafi, who is under siege by rebels across the country and by Nato air strikes. The visit was part of FIDE's “Year of Africa”, and Ilyumzhinov, who has had good relations with Gaddafi for years, played a game of chess against his eldest son Muhammad, Libyan state television reports.